Governments throughout the so called democratic world, in the last decade or so, have somehow instituted and normalized a "culture of secrecy". A significant amount of government business is conducted in secret. Secrecy in issues related to national security may be understandable to a degree, but when the constitution is shredded and heads of agencies lie to the congress with impunity, whistleblowers become our only source of truth. In reality, "the culture of secrecy" is not limited to issues of national security. Special interests and lobbyists operate behind the veil to secretly negotiate laws and agreements with governments - issues that effect every aspect of our lives. The governments are not doing their jobs. The "fourth estate" is not doing its job. 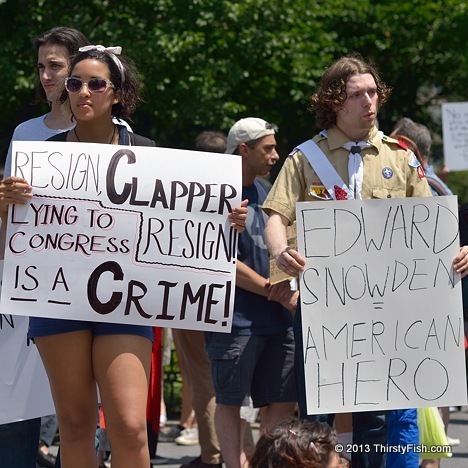 We're only left with whistleblowers to break this "culture of secrecy": Prominent former whistleblowers recently wrote an open letter to intelligence employees encouraging them to follow the example of Edward Snowden. SECRET meetings lead to SECRET laws approved by SECRET judges in their SECRET courts. While, SECRET weapons funded with SECRET money by SECRET agencies go to kill SECRET suspects. The SECRET suspects (who are not killed) are placed in SECRET prisons while SECRET tribunals decide their SECRET cases with SECRET evidence... What could go wrong? I would have added: "...SECRET trade agreements negotiated in SECRET..."